The ComfortFull 2 makes it easier for patients who breathe through the mouth while sleeping to comply with therapy and get a good night’s rest. This lightweight, durable design delivers more comfort and a better seal than any full-face mask we’ve ever produced. It’s one more reason you can fully count on the Comfort Series to help you fit 100% of your patients 100% of the time. The ComfortFull 2, like all masks in the Comfort Series, is latex free. 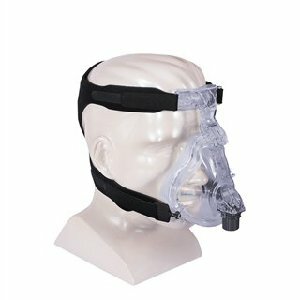 The ComfortFull 2 has been designed to provide the comfort, seal and support patients need to maintain therapy compliance - especially those who find nasal masks unsuitable because of mouth breathing. And it sits lower on the nose, eliminating pressure on the nose bridge. Soft, dual-flap cushion has been redesigned to be more forgiving for broader noses. Polished clear cushion surface provides a more secure seal without sacrificing comfort. Adjustable ComfortHeadgear and StabilitySelector help provide a more personalized fit. New cushion and faceplate are now just one lightweight piece. All of which means that the ComfortFull 2 is the best option available for a full-face mask. That's good for patients - and for clinicians.